When most of my friends started to drink coffee in junior high / high school, I never got into the habit. I don’t really like the taste of coffee (but the smell is so good! ), so I’ve slowly become a rather passionate tea drinker. I’ve known to drink and buy lots of tea, and we usually have a pretty extent variety of different flavors at home. I love green tea (like, really love it), but in the evenings I go for herbal teas like chamomile, or make a ‘potion’ out of chaga or reishi. A couple years ago I found matcha and fell for it instantly. I love the steady buzz it gives me and finally I was able to order a latte at a cafe, yay! I make my own matcha lattes with both water and plant milk and always add a bit of vanilla. Sometimes I add a bit of coconut butter too and blend it in my blender, so that the latte becomes very frothy. If I’m looking for a sweeter drink, I add a fresh date (to the blended version), or just a dollop of honey. In the summertime I’m all about iced matcha lattes, but before I get too much into that, I wanna tell you about this new love of mine, a.k.a. 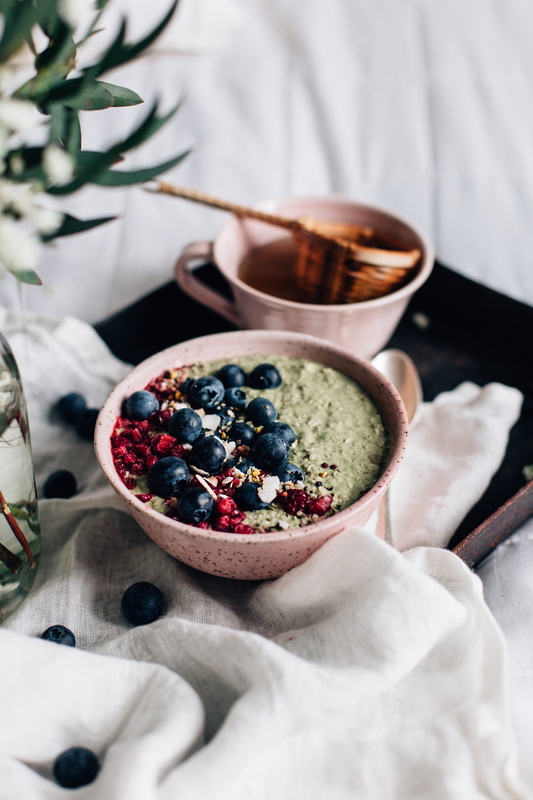 matcha overnight oats! 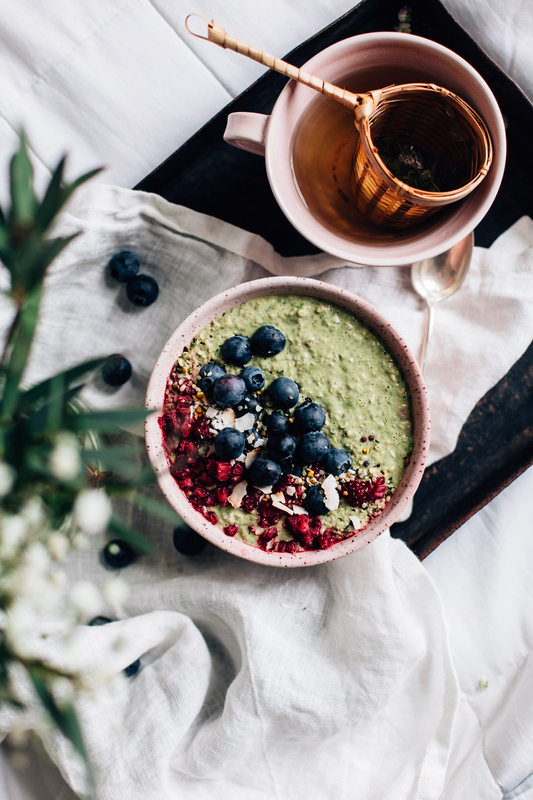 Besides rambling about my love for matcha, I thought I’d share a few great links that I’ve found inspiring lately! A few years back I used to share this kind of stuff monthly but then gave up on the habit, so this is my way of bringing that tradition back in a relaxed, not-regular way, which seems to be my way of working. Enjoy the porridge + the links, friends! I’ve been daydreaming about a vegan + gluten-free summer cake for a while now and this one looks so gorgeous, that I need to come up with a recipe soon! The 10 things to remember this week. And every week. These chickpea cookies with dark chocolate, YES PLEASE! If you live in Helsinki, I strongly recommend eating in MAT at Iso Roobertinkatu. I go there way too much and love their vegan patties, and that gluten-free buckwheat bread! I also love being out in the sun and sunbathing, but I try to be careful with my skin. My favorite sun screen has been the Puhdas+ sun screen but now I’m trying out a spray from Algamaris, which smells wonderful and spreads really well (they’re both natural cosmetics). So with these buddies, I’m all ready for a hot and steamy summer – hope you are too! notes: as I mentioned above, I use mashed banana to sweeten the porridge and it makes the porridge creamier too. if you’re not into bananas, you can use 1 to 2 teaspoons of your desired sweetener. 1. Measure the rolled oats, chia seeds, and almond milk in a bowl and mix well. Place the bowl in the fridge for a few hours, or overnight. 2. Slice the banana into small pieces and smash with a fork. 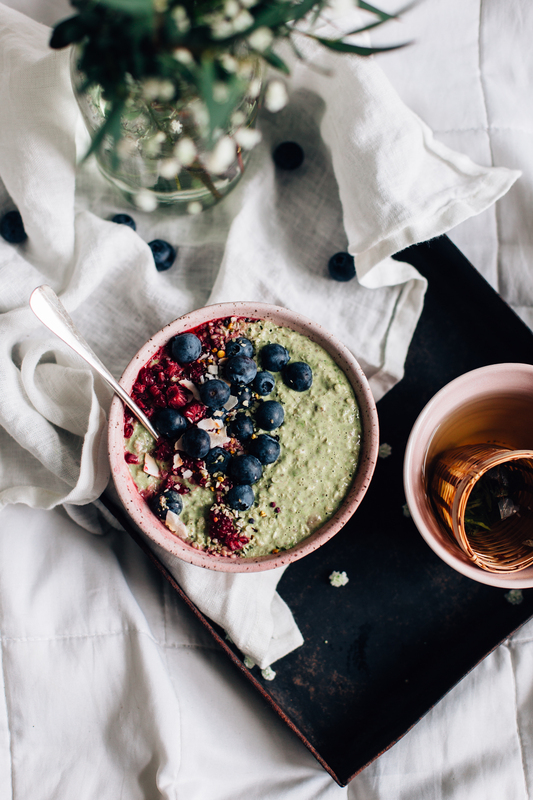 Add the banana mash, matcha powder, and vanilla to the porridge and mix well. Add a little milk if the porridge feels too thick. Top the porridge with berries and enjoy! Tagged breakfast, matcha, nut free, oat, porridge, vegan. Banana Split Deluxe + N'Ice Cream News! Vegan Banana Split Deluxe with homemade Date & Coconut Ice Cream, fresh berries, and shaved chocolate is the only way to celebrate our new e-book! The secret to this Tropical Greens Smoothie is frozen pineapple, which makes it super fresh! Thank you for the lovely tag. ps. the very last book I purchased…N’Ice Cream ;). Putting my ice cream maker to work, trying new things, making too much ice cream and lacking in freezer space.